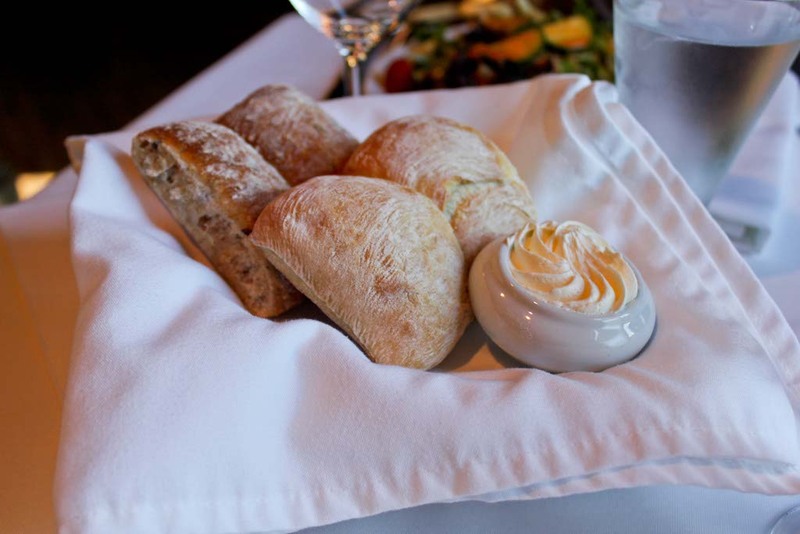 The bustling and popular Five Fishermen Restaurant in Halifax, Nova Scotia has an unsinkable history; it was once Snow’s Funeral Home and housed bodies recovered from the Titanic. The reviews for the restaurant are equally unsinkable, though, so I thought I would give it a try. On my last night in Canada, accompanied by my sister and her boyfriend, I reeled in a delicious dinner at Five Fishermen. 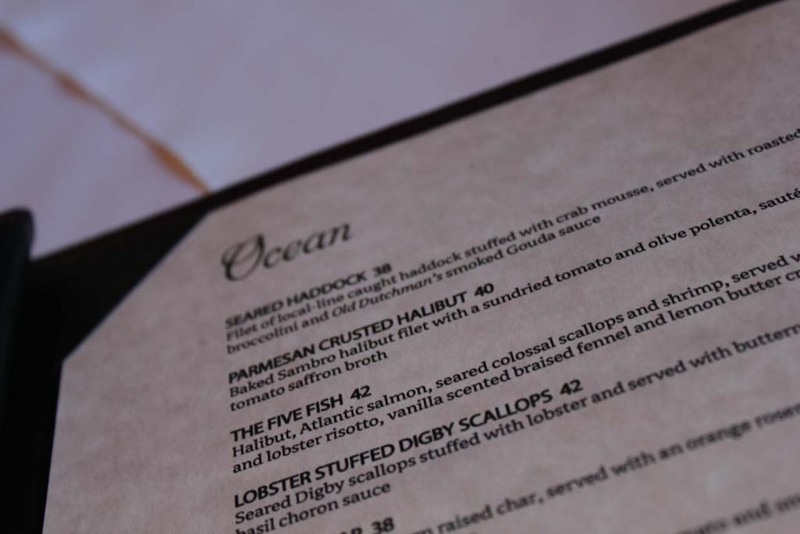 Conveniently located next to the World Trade and Convention Centre, The Five Fishermen Restaurant & Grill is recognized as Halifax’s finest seafood restaurant. 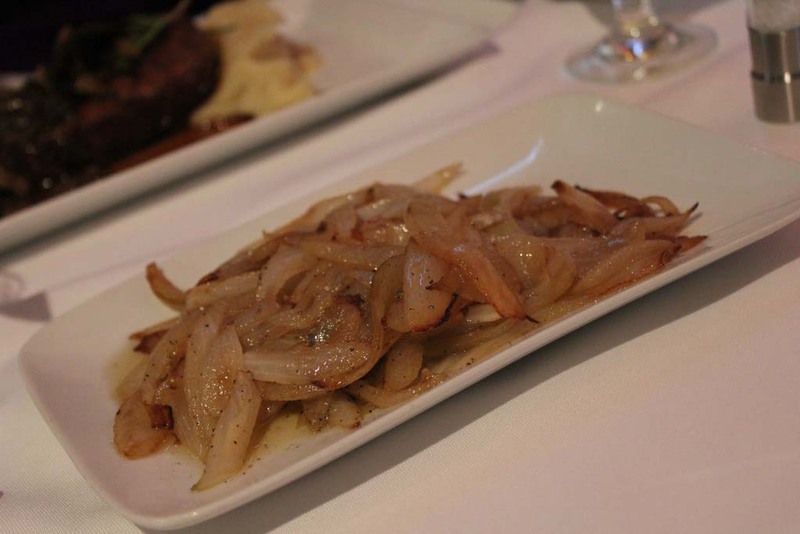 Known world wide for its fantastic cuisine, friendly staff and rich history, they provided exceptional quality, a downtown view, unparalleled service, and a memorable evening. On April 15, 1912, the Titanic, on her maiden voyage, went down off the coast of Newfoundland after hitting an iceberg. Rescue operations were run from the nearest mainland port of Halifax. The bodies of some of the wealthier victims such as John Jacob Aster, the wealthiest man on the ship, and Charles M. Hayes, the president of Grand Trunk Railway, were brought to Snow’s Funeral Home. It wasn’t until 1975 that Snow’s Funeral Home became the Five Fishermen. Although I’m not a superstitious person, I doubt I would have dined with ghosts from the Titanic if I had of known beforehand. Luckily, I had no idea because it was one of the finest dining experiences of my life. 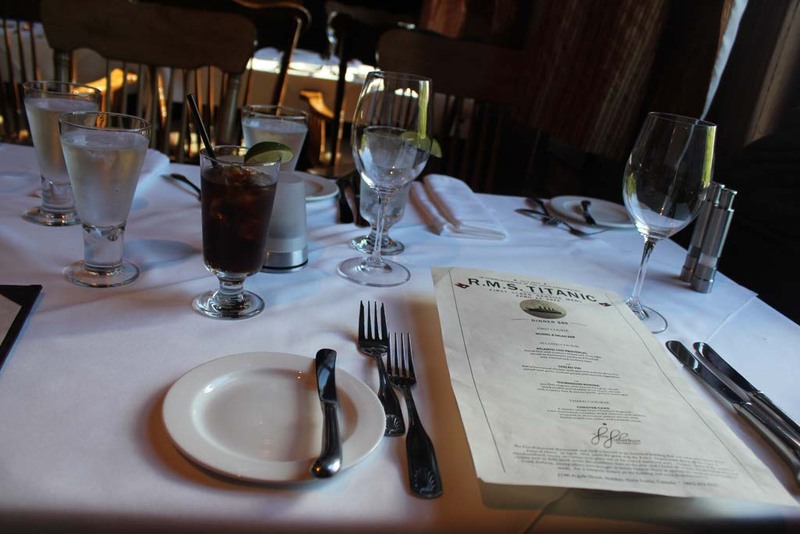 When we entered the restaurant, we were brought upstairs to our table by the window. 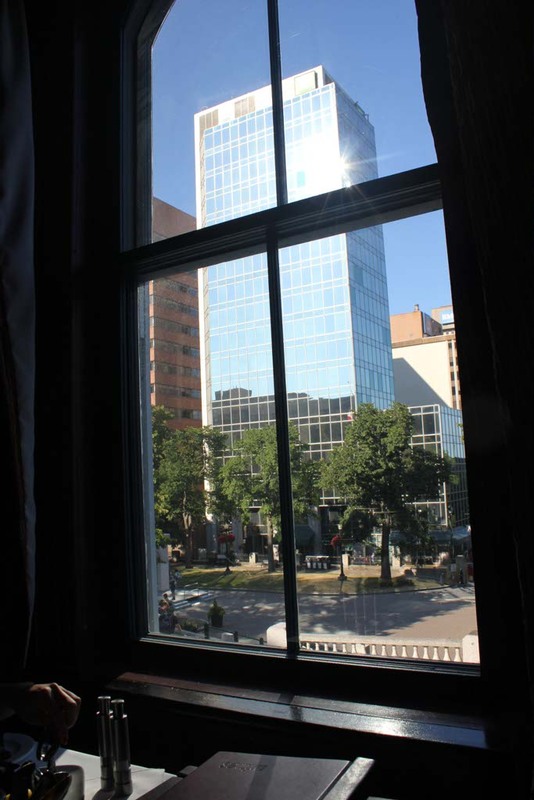 Curtains drawn, we had a spectacular view of downtown Halifax. 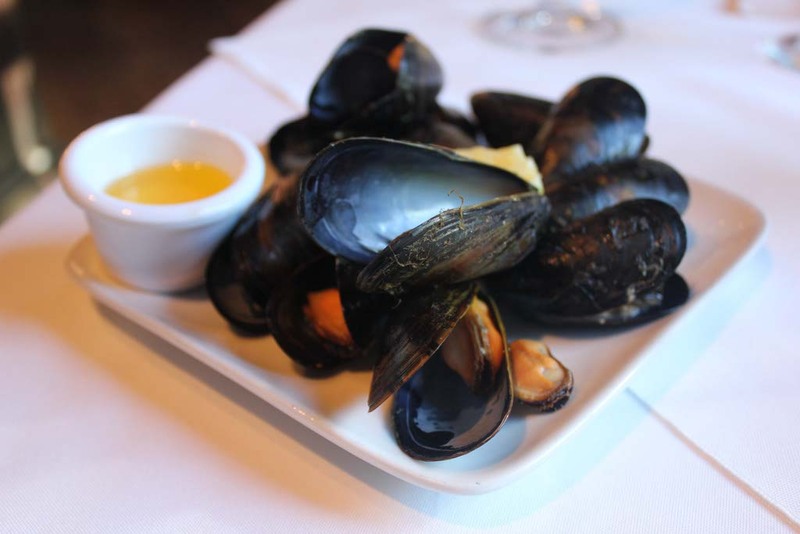 Our dinner began with a true Maritime tradition, the complimentary salad and mussel bar, with a choice of sauces for the mussels and dressings for the salads, and warm breads delivered to the table. My sister was in heaven as she loaded her plate with steaming, cultured mussels smothered in a house sauce. 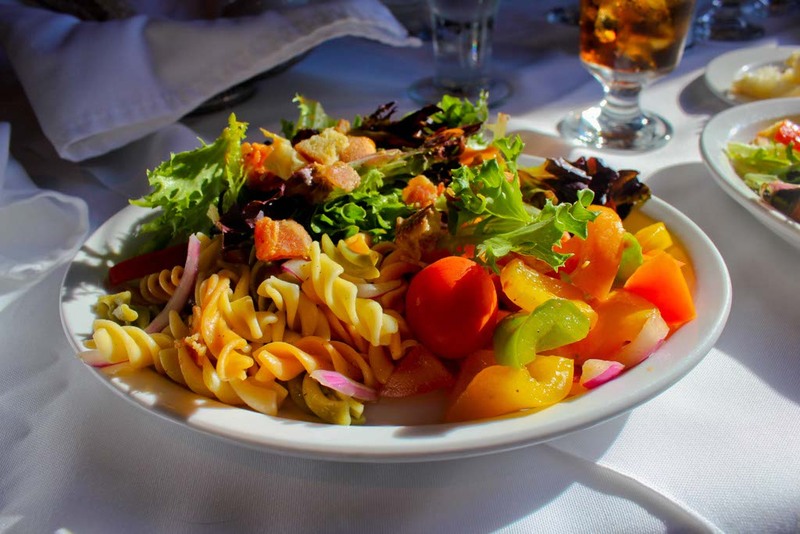 My eyes grew with delight at the sight of countless salads both lettuce and pasta based. 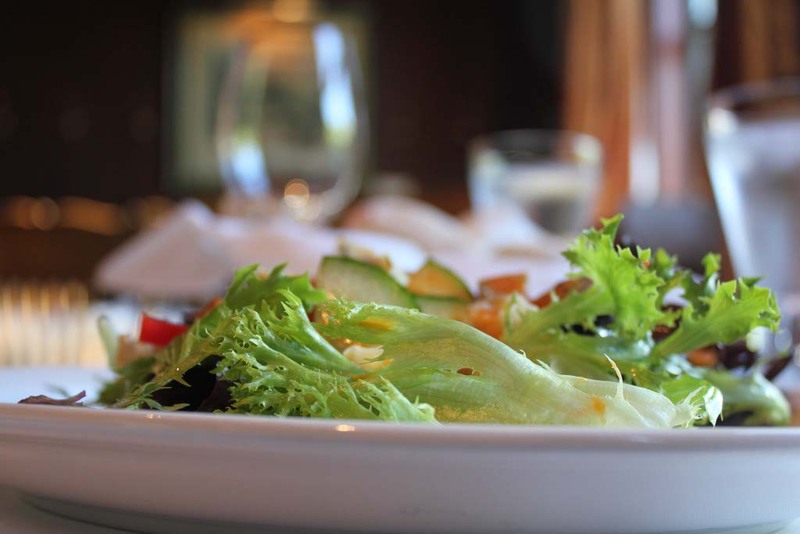 My meal could have solely consisted of salad and I would have left satisfied, but the best was yet to come. 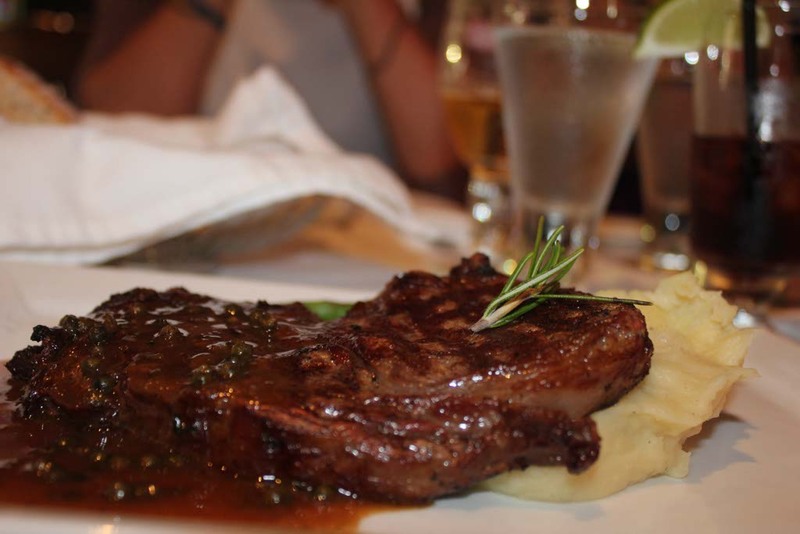 For my main course, I chose the rib eye steak with peppercorn sauce. 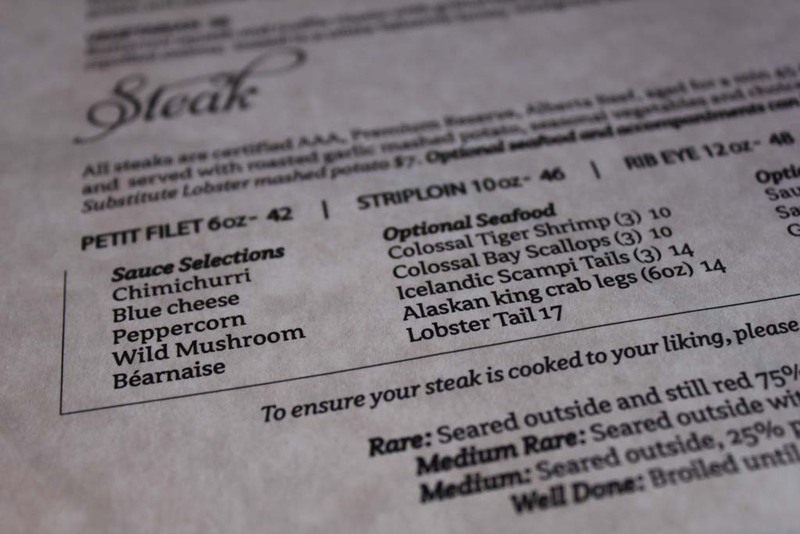 Suzanne, my sister, chose the striploin with wild mushroom sauce. 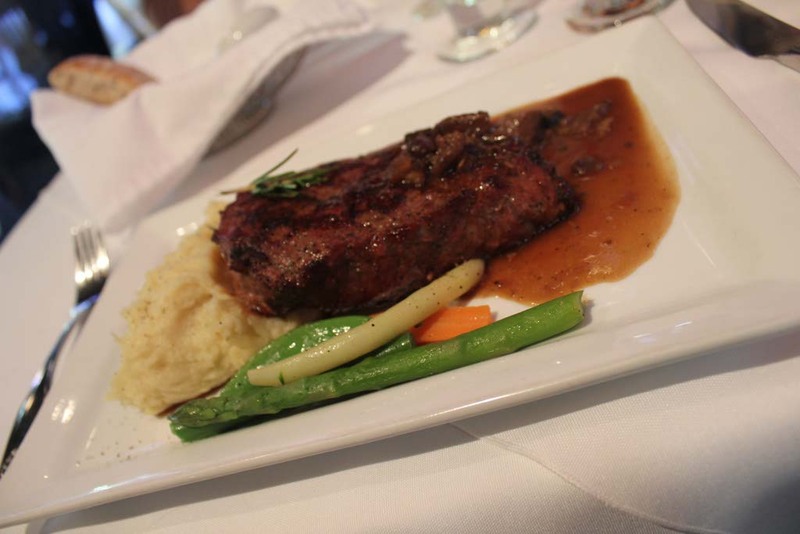 All Five Fishermen steaks are certified AAA, Premium Reserve, Alberta Beef, aged for a minimum of 45 days. 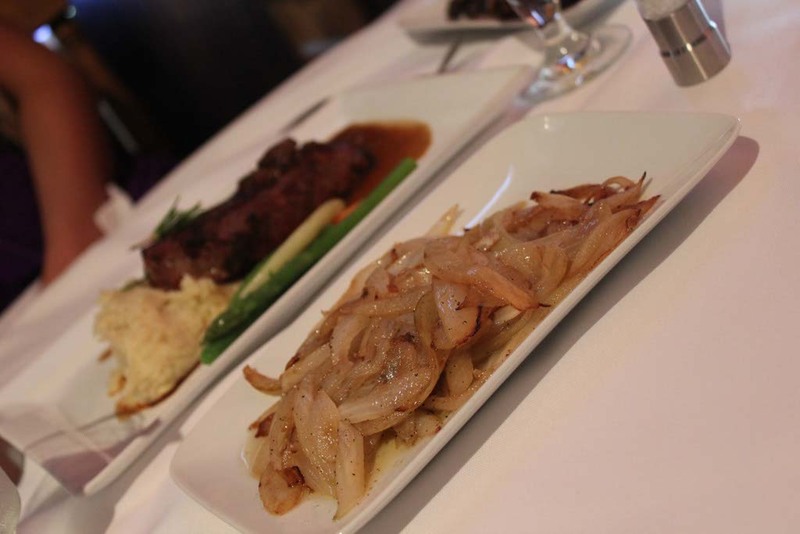 Both steaks were served with roasted garlic mashed potato and seasonal vegetables. 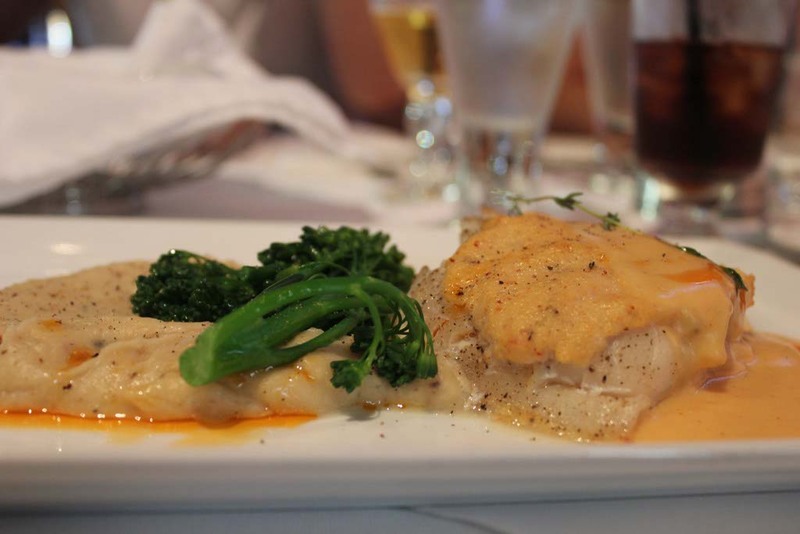 Jordan, my sister’s boyfriend, selected the seared haddock, a filet of local-line caught haddock stuffed with crab mousse, served with roasted cauliflower puree, broccolini, and old Dutchman’s smoked Gouda sauce. The thought of red in my steak is normally unappealing, but after trying my sister’s medium steak, I’m converted! The flavor and tenderness of her medium steak is still making my mouth water. All of our plates were perfectly prepared and professionally presented by a waiter who was polite without being intrusive. 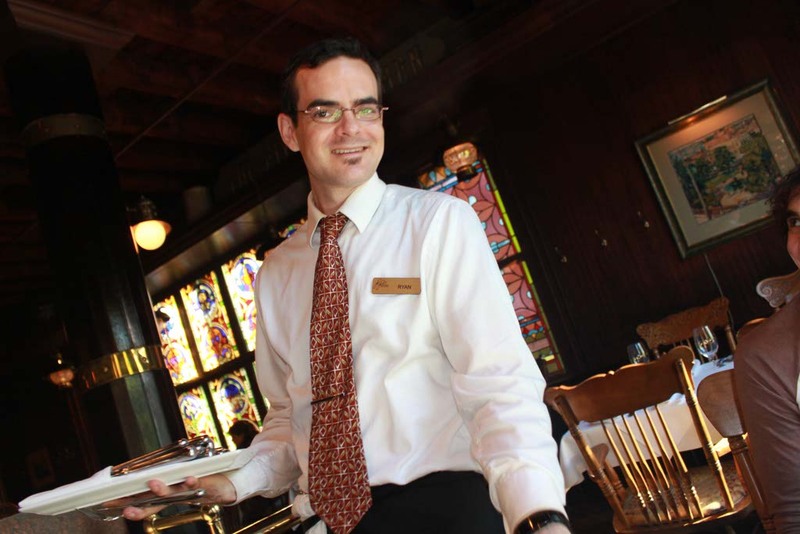 He seemed to magically know exactly when to fill our glasses, remove our plates, and ask about our experience. They offered a good mix of local dessert choices as well as traditional favorites. 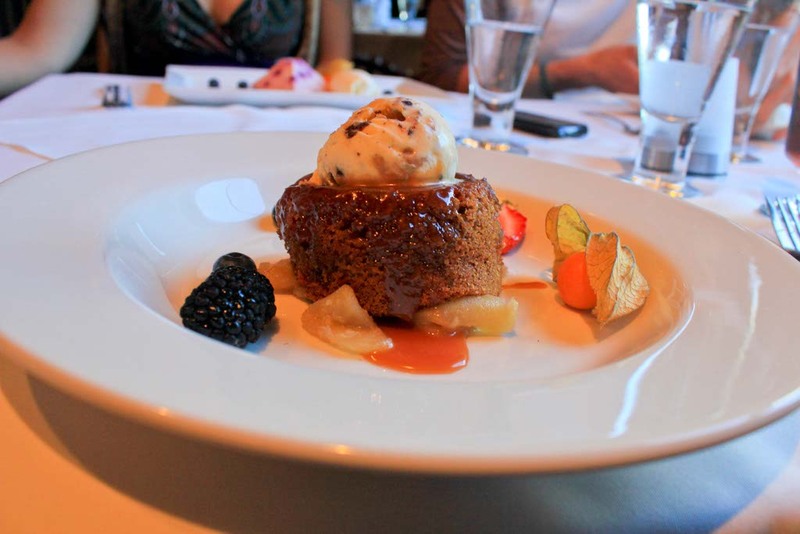 I was able to fit in a delicate dessert of sticky toffee pudding, served warm with caramel bourbon sauce, choclate toffee ice-cream and Annapolis Valley apple compote; it was a delicious reminder that I was home. 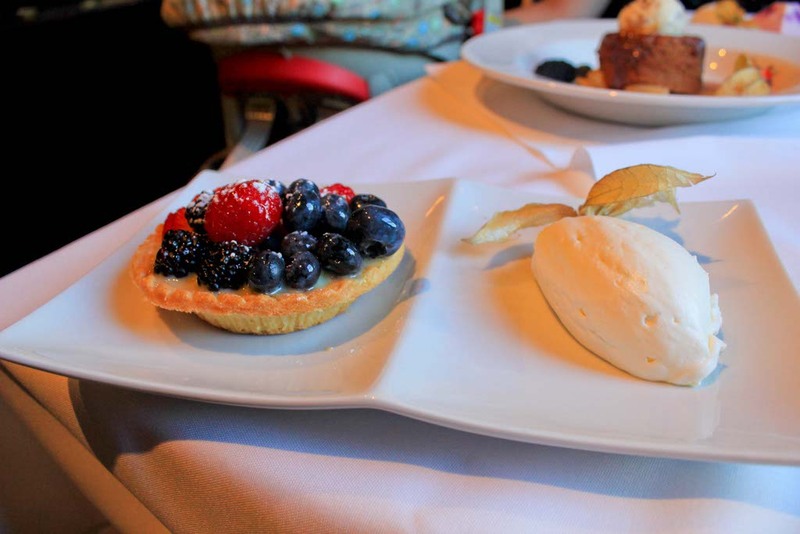 Jordan selected the fresh berry tart filled with confectioner’s custard, fresh field berries and topped with Chantilly cream. It was Suzanne’s blueberry lime cheesecake made with local wild Nova Scotia blueberries, wafer cookie, white chocolate cream and blueberry coulis that made me drool. Thankfully, she was overly stuffed from her steak dinner and couldn’t find room for all of her dessert; I happily finished off her plate (after eating my own of course). Next time I dine with my sister, I’m going to let her order for me since I basically ate everything off of her plate. 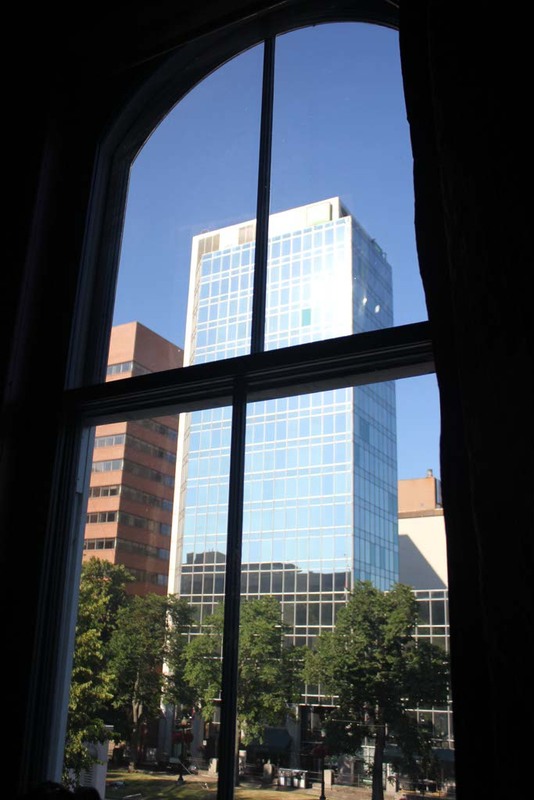 The view of downtown Halifax only added to the enjoyable dining experience. With the tall ships in the harbor and local musicians playing in a nearby park, I reveled in the beauty of Nova Scotia. I may live in another country and have no intentions of moving back to Canada, but the summertime views and local culture are hard to beat. 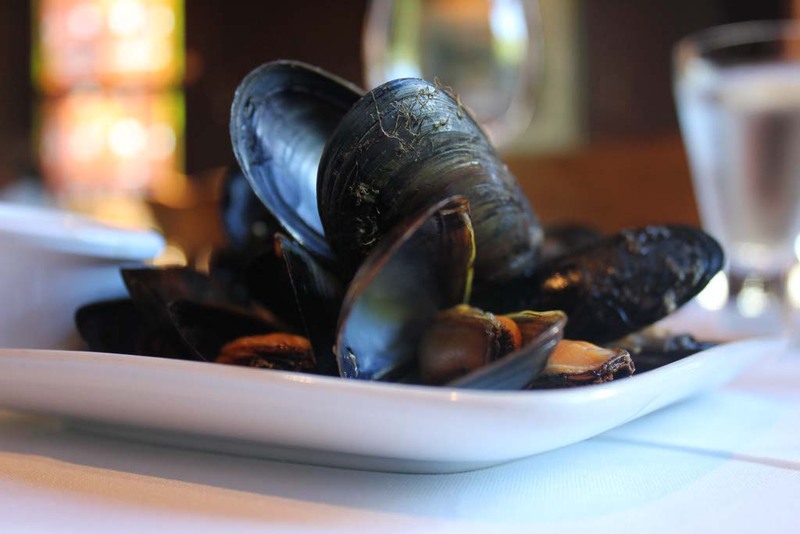 Five Fishermen Restaurant is not a cheap night out, but you most certainly get what you pay for with their unlimited salad and mussel bar, aged-to-perfection steaks, famous seafood, and local desserts. I’d return in a heartbeat, even if I am dining with ghosts. What a yummy looking dinner! Thanks for sharing the beautiful pics!!! What a fabulous rich history the restaurant has.. I’d probably spend my meal asking all the staff for more bits and pieces about the place! 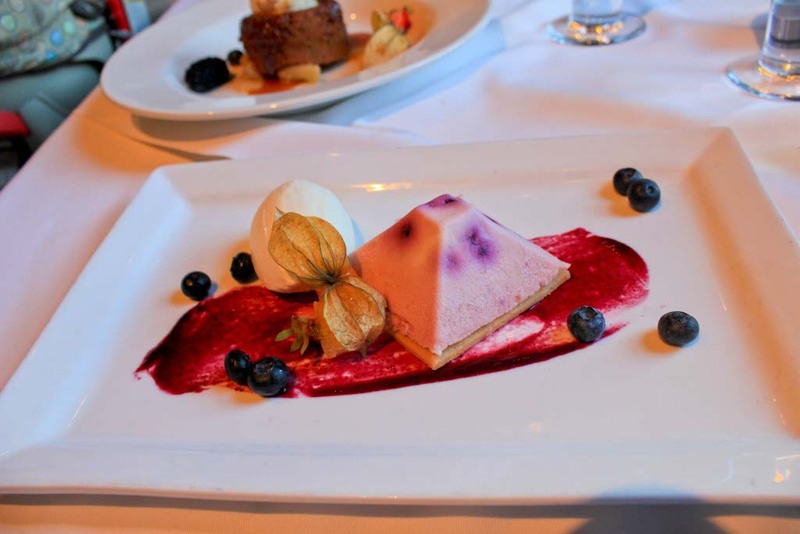 Meal looks fab – I’d definately be snaffling that cheesecake too! What a great story that place has!